Contrary to what was said by an alleged Ford employee in an unsanctioned and unconfirmed Reddit AMA earlier this week, Ford executive vice president and CTO Raj Nair confirmed to Autoline that the new Ford Bronco will be a completely different vehicle from the global market body-on-frame Everest SUV. Get excited. This new Bronco will be based off the Ranger platform and so it’s going to be a similarly sized vehicle to what you see in the Ranger. Now, for our American customers who have never seen that global Ranger, it’s a bit bigger than the Ranger we used to have here in the U.S., so I would say it’s kind of in-between in what you saw with that really big Bronco [the 1992-1996 model], and then the smaller Bronco [1966-1977]. ﻿No, it’s a separate vehicle [from the Everest]. It will be an incremental vehicle from the Everest. The Everest kind of serves a lot of off-road capability; maybe the space the Explorer serves here in the U.S., but with a body-on-frame construction with a lot more off-road capability for the rest of the world. This Bronco is completely unique from that Everest. It is body-on-frame and so again, focusing on that off-road capability. And our friends at The Truth About Cars also debunked the Redditor’s claims, and had some reported (but again, unconfirmed) details on how the Bronco’s roof could work. The Everest is an existing body-on-frame SUV built for global markets, giving credence to what the Reddit AMA said. However, Bronco aficionados everywhere became worried that the new “Bronco” would look like the Everest, which despite being a real SUV, looks about as exciting as toast with butter on it. This is good news, then. Expectations are clearly high. Look at how much attention that render from Bronco6g.com gets every time we post it. People want a Bronco, and they want it to look like a Bronco, ideally with an open roof, two doors and some badass offroading pretenses. 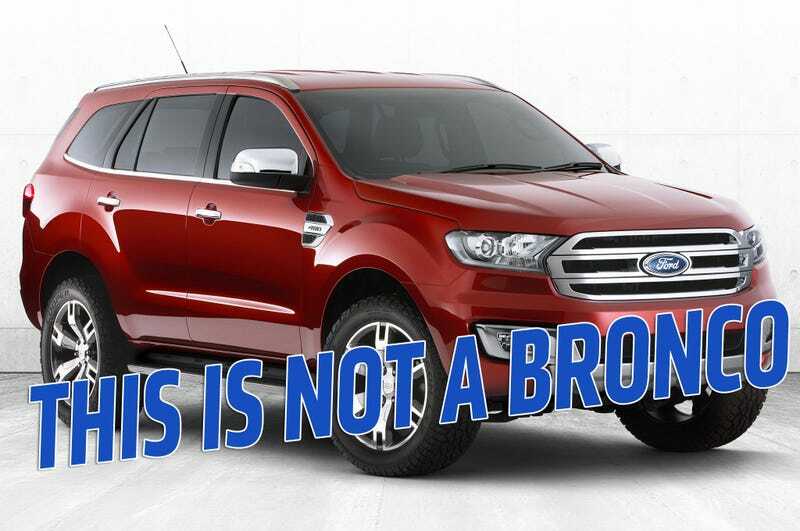 Don’t screw this up, Ford.